At Minnie Mouse Party Party Supplies, you'll have your pick of cute, affordable, and useful items to make your next child's birthday party perfect! You can find things like tableware including plates, cups, napkins, and utensils, decorations like pinatas and balloons, personalized items like invitations and stickers, and much more! Minnie Mouse has been entertaining young and old since the 1920s, and today she is more popular than ever. If your little girl loves her cheerful personality and can-do spirit, Minnie makes the ideal theme for a memorable birthday party. Along with her best friend Daisy Duck and colorful characters like Clarabelle Cow, Minnie is sure to provide plenty of inspiration for a party that your little girl and all her friends will enjoy. Whether you go with the classic Minnie colors of red and white polka-dots or you opt for modern Minnie who adores everything pink, you’re sure to have a theme that puts everyone in a mouse-tastic mood. Her nickname is Minnie after all, so when planning the party menu, why not make the theme “mini” and opt for finger foods and other bite-sized treats? For example, mini corn dogs, finger sandwiches and a crudités plate with bite-size fresh veggies are ideal for lunch or dinner. Minnie Mouse is a timeless cartoon character and there’s one signature item you’ll always find on her outfit: a big beautiful bow. In addition to having your daughter wear a bow in her hair for the big day, consider adding bows throughout your décor for a festive look that’s easy for anyone to create. To throw the perfect Minnie Mouse birthday party for your daughter, you must have the perfect decorations. Transform any space into party-central with our collection of cute décor that is guaranteed to impress guests young and old. Whether you are throwing your baby girl the ultimate first birthday party or your big girl wants to celebrate her birthday with all her little friends, you’ll instantly set the tone for a fun, festive time. From balloons to bows, Minnie ears to piñatas, you’ll find everything you need so you don’t have to stress. Foil balloons make any party fun. Your birthday girl is sure to love this jumbo Minnie Mouse balloon on her big day. 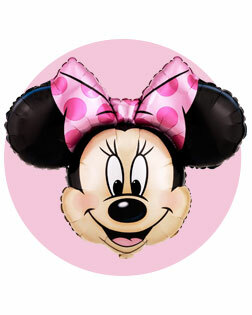 With Minnie’s big grin and a big beautiful pink polka dot bow, this balloon is perfect as a centerpiece, at the entryway of the party or by the gift table. Hey Mom and Dad – there’s no need to run from store to store to find everything you need for your daughter’s Minnie Mouse birthday party. Our decoration kit has it all, so your party will be perfect and you won’t have to worry. Get ready to earn parent of the year! Minnie loves sharing treats with her best buds, whether it’s at a tea party, dance or outdoor picnic. Your little girl will want to do the same, so get the table ready for some delicious delicacies and dreamy delights. You’ll want to get plates and napkins that feature Minnie, of course, but don’t forget the napkins, cups and plastic ware. All the party guests will feel like they are visiting Minnie’s boutique for an official party when they sit down to such a lovely table setting. To keep all the little Minnies at the party from bouncing off the wall, try planning a few fun activities. Games and projects are a great way to help all the children get to know each other, plus it’s a lot of fun to watch everyone giggle and have a great time. One idea inspired by Minnie’s Bow-tique is to set up a craft table and let kids decorate hair bows they can then bring home. Simply buy plain bows at the local craft store, as well as fabric glue and plastic jewels. Then help each child adorn her bow with all the pretty sparkles she desires. It’s sure to be an instant hit! Want the kids to have a whirly, twirly good time? You can’t go wrong with our Disney Minnie Mouse Piñata Kit! This all-in-one kit has everything you need: Disney Minnie Mouse Pull-String Piñata, candy and toy piñata fillers, a piñata blindfold and piñata buster. Want to take your party from average to amazing? Get your daughter an adorable Minnie Mouse costume to wear on her big day. Whether she dresses like Minnie for the entire party or just while greeting guests upon their arrival, she’ll smile from ear to ear because she will look just like her favorite cartoon character. Of course a party isn’t a party without guests, and you’ll want to thank all the little mouseketeers that came to help your daughter have the most memorable birthday ever! 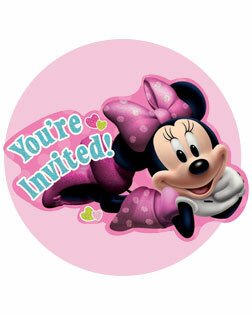 Create thank-you gifts packed with Minnie Mouse-themed party favors for each child who attends the event. 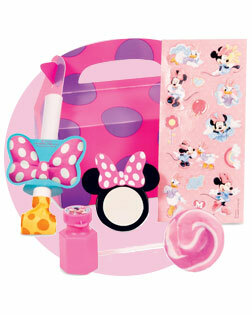 Items like pink bubbles, mouse ears, stickers, puzzles and crafts are great favors. Our Minnie Mouse party collection includes a variety of favors that are sure to make kids smile after the party is over. Have your daughter hand out the favors as each child leaves to show appreciation for such a mouse-tastic time. 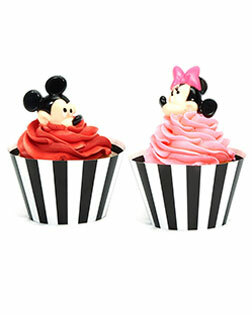 Send guests home with a treat that Minnie Mouse herself couldn't resist – a dressed up cupcake! Our Disney Mickey and Minnie Mouse Cupcake & Wrapper Kit makes it simple with everything you need, like cupcake rings and reversible cupcake wrappers that let you choose from two fun patterns. Get a lot of glam for less to thank all the Minnies at the party with our Disney Minnie Mouse Bow-tique Party Favor Pack. A total of 48 pieces (six favors for eight guests) gives everyone something special to take home. With rings, tops, bracelets and more, there’s something fun for everyone!